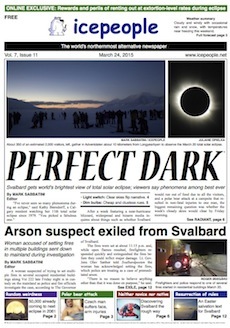 It’s a new record for dimness with our first 12-page issue ever, courtesy of a total solar eclipse that cast light on Svalbard’s brightest and blackest sides. Unfortunate incidents such as a polar bear attacking a camper and a woman exiled for allegedly trying to set several buildings on fire were overlooked by nearly all when the skies finally cleared on Eclipse Day, providing longtime “shawdowflies” with what their called their best viewing experience ever. Check out this week’s PDF to see why more than 50,000 people are already making plans to see the next one here in the year 2061.